Which ring makes the most sense? 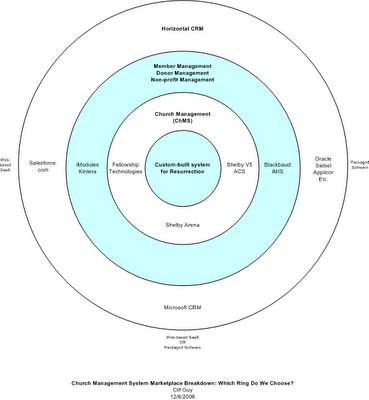 Here’s how I see the Church Management System (ChMS) marketplace. We’re confronting the question of which ring of the market makes the most sense for us. As you move in toward the center, the functionality is a closer and closer match to our requirements, but fewer and fewer organizations will be running it. On the outer rings, more organizations are innovating and influencing the feature set. On the inner rings, fewer organizations are innovating, but the features are more likely to be directly applicable to us. As someone who has been through this process the one thing I would suggest is that if you narrow your thought to software which will be influenced and development extended that will be of most benefit to the church market, then I think you eliminate the CRM solutions. Yes, they are widely deployed and being heavily invested in by many business organizations, but not for the church market. IMHO, Fellowship One has the most aggressive development and deployment schedule of any ChMS out there. They are lookiing at this from every angle and are willing to listen to the needs of the customers, and most importantly are willing to adjust their development schedule to accomodate the needs of churches. Usablility is the other huge issue to me. Could a custom solution offer every nuance I would love to have, yes. Would it be a clean, well designed interface, with lots of training and support resources?. Generally no. Just some of my random thoughts.